Magical Twilight Stars plays 6 soothing sounds to help little one’s with sleep. Timer options can be set easily between 25 and 45 minutes. Colour mode’s can be changed from: red, blue or yellow, or auto cycle option can be enabled. I am so impressed with this night light. I brought it for my 2 and 5 year old as the GroOwl we have isn’t bright enough. They love the stars on the ceiling and soothes them for bed time. It is a lot bigger than I expected but I really like that it is big so it covers the ceiling with stars. I think if it was too small it would not work so well. You can have it on a set colour, which this one has blue, green and orange. 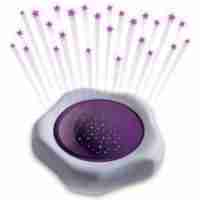 It also does changing colours, so switches between the colours so when get the blue it goes purple then green. I find that it is bright enough to give them a bit of light but not too bright that it stops them from sleeping. It also has a timer so after 25 minutes the light goes off and can put it back on if needed for another 25 minutes. I don’t use the music on it but I have tested it out and it swtiches between lullabies and rainforest, animals, rainfall kind of sounds. They are quite soothing noises to listen to. If you have children that need a night light this is perfect. I got this for my grand children who are 9 months 3 years 6 years, and i think it’s one of the best things i have got for them. The light itself is bigger than you think, it’s 8 inches in diameter and made of a think white plastic with a coloured top, i have the blue top, which has loads of little stars cut out of the blue section. Underneath you have the controls, a volume dial, music change button, on/ off switch and a timer light hole, then you have the part where you put three AA batteries, which do last quite a long time, but if your using this all the time maybe it would be better to invest in so rechargeable batteries. Press the on/off button once to turn on then keep pressing to change the light colour, the music button will keep changing the tunes, there are various different ones including white noise, river and birds, and mothers womb all designed to soothe your child. You also get a timer in which you can let the machine turn off after 25 mins or 45 mins, so theres is no need to go back in the room and disturb the children. I really love this light, i even sit there sometimes and chill out with the light on, especially is im getting a headache. You can also wipe this light down with a damp cloth and you don’t have any wires to worry about, so it’s totally child safe. Perfect. I received this Night Light at a reduced price in return for a honest and unbiased review, which i feel i have done and i hope my review will help other people with their decision to purchase this product. If you feel my review has helped you please press the yes button below. Thank you. My son and daughter-in-law love this night light for their baby boy he loves watching the light show. My venture magical twilight stars night light projector arrived on time and well packaged. The magical twilight stars night light projector came in a well packaged box. Inside the box you get your projector light and a set of instructions on how to use the projector. The projector light was a lot bigger than I was expecting. The projector takes 3 AA batteries which last rather long once inside. When the night light projector is on it looks pretty well amazing from my point of view. You can chose between a selection of 6 different soothing songs to help your baby or toddler get a better night sleep. The projector has an automatic shut off timer which turns off the projector after 45 minutes or you can set the projector to turn off after 25 minutes. I found this feature on the projector brilliant as you do not need to keep going in and out of your child’s room every night to turn off the projector and risk waking your little one up after they have just dosed off. This projector is a soothing and brilliant way in order to get your child asleep and not have them scared of the dark when in bed. Please note; I received this product at a discount in return for an honest, unbiased review. I hope you’ve found this review helpful, and thanks for taking the time to read it. If so, please click the “Yes” button below this review. I receive products at a discount, or occasionally free of charge, in exchange for a fair, thorough and honest review. If you have any further questions about the product, or any other comments, please add them below and I’ll get back to you as soon as possible. Alternatively, make use of the “Ask a question” function on the listing, you’re likely to get several responses from both the supplier and other customers within a few hours. Love this so much, the stars are so pretty & the music nearly sent me to sleep. I know my grandson will love this too. I bought this for myself (I’m 46) as I am an insomniac. I love it. It soothes me when I wake in the night..very calming. The orange light is best as the green and blue ones are very bright. Liking the sounds except mother’s womb. Yes it did meet my expectations and my grandson’s too. Seems ok. Not used much yet as grandson only 7 weeks old. Bought this to help my baby settle at night and so far he loves it, totally mesmerised by the changing colours on the ceiling and walls and seems to be helping him settle. It’s got several colour options and some nice relaxing sounds to play. The unit itself is bigger than what I was expecting but am still very pleased with the projector. I think the item is neat, the light is not super bright but by no means dim. I would’ve given it 4+ stars if it wasn’t for the price. I think 20 is a bit much for it, so better grab it on a deal. If it had at least a rotating option it might’ve justify 20. If your kid seems captivated by lights and stares at them at every opportunity, then this would certainly be a hit, just be mindful of the price. Great soothing nightlight. Best I have found. My son loves the light projections and the auto switch off is useful. Definitely recommend. We don’t use the music feature that much, but the light projection on the ceiling and walls is amazing. Great product. I’ve now bought this product four times: for my own children who are 3 and 7 and twice for presents. All of the kids love it! The stars are projected strongly and clearly in a medium sized room and change colour every few seconds. We also have another light projecting brand (the turtle animal) but this item is far superior in terms of the strength of the projection. It’s very relaxing and it also has the option of adding sound too – I think there is a choice of 3-4 sounds. Would highly recommend! 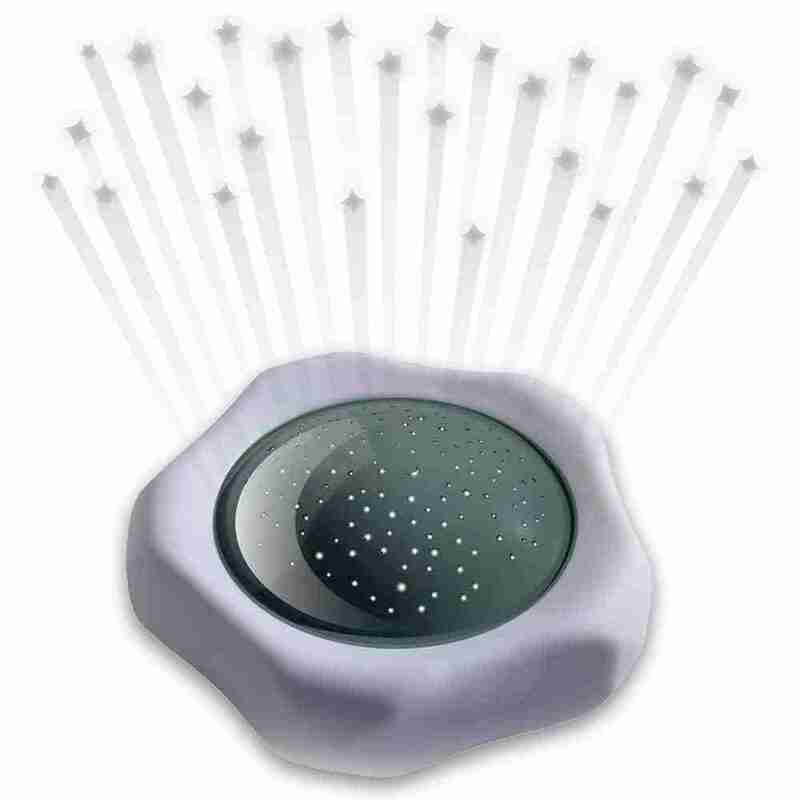 Help your little one drift off to sleep with enchanting sounds as soothing colour changing stars fill your childs room. If your baby has trouble getting to sleep, or if your child simply has a fear of the dark then this nightlight may be the answer! 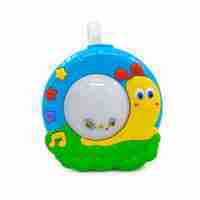 With multiple timer options and colours to choose from this nightlight is perfect of anyone.